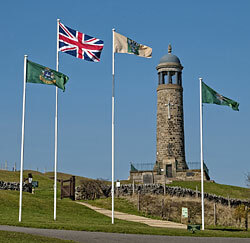 The Regimental Memorial Tower at Crich. The Regimental Memorial Tower surmounted by a beacon light rises above the Derbyshire village of Crich. It was opened and dedicated on 6th August 1923 and commemorates to all those of the Regiment who have died in the service of this country. The impressive memorial to Albert Ball VC in the grounds of Nottingham Castle. On the Grantham Canal, between Kinoulton and Owthorpe there are two information boards commemorating the actions of the 9th Battalion Sherwood Foresters at the Battle of the Somme between July and November 1916. 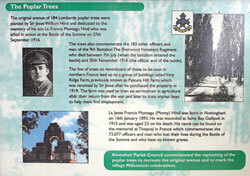 One describes the avenue of Lombardy poplar trees that were planted near Kinoulton to commemorate the life and death of Lieutenant Francis Montagu Hind, of the Sherwood Foresters (killed in action on 27 September 1916) and the 183 men of the 9th Batallion The Sherwood Foresters Regiment who died during the battle. The other board provides additional information on the batallion.